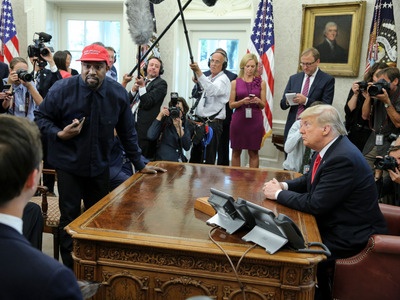 GettyKanye West met with President Donald Trump at the White House on Thursday. He’s also outspoken and has many opinions on culture, philosophy, and President Donald Trump. While that could potentially make him a liability for Adidas, CEO Kasper Rorsted told Business Insider in a recent interview that he doesn’t worry too much about it. Kanye West, who designs and develops his Yeezy line with Adidas, is one of the sportswear company’s most famous collaborators. He’s also one of the most polarising, making headlines on a near-constant basis for his penchant to say things many view as controversial. On Thursday, he met with President Donald Trump, one of the most polarising figures in the world, and apparently ad-libbed a 10-minute monologue. But West’s sometimes erratic behaviour doesn’t worry Adidas’ leadership. “When you have a business model like ours, of course there is liabilities, but also opportunities that go hand in hand,” Adidas’ global CEO, Kasper Rorsted, told Business Insider during an interview earlier this week. “Of course, we look upon what do they bring to the table and do they represent certain views that are not aligned with our values,” he said. But, Rorsted said he doesn’t worry too much about them saying something controversial. “If you want the ultimate creativity, then you get that, and you have to live with the fact that sometimes some person will say something that maybe you don’t subscribe to, but there might be others that do subscribe to it,” Rorsted continued. Rorsted said that Adidas has “hardly any political view,” but it does have a stance on issues like sustainability, fair trade, and labour.